Anna Eleanor Roosevelt was born in New York City on October 11, 1884 to a wealthy family. Her father, Elliott Roosevelt, was the younger brother of President Theodore Roosevelt, and her mother, Anna Hall, was a member of the prominent Livingston family. Eleanor was orphaned as a child, and lived with her grandmother Mary Hall in Tivoli, New York. Eleanor attended Allenswood Academy, a school for girls in England, where she studied under Mademoiselle Marie Souvestre. Souvestre's tutelage shaped Eleanor's social and political career. On March 17, 1905, Eleanor married her cousin Franklin Delano Roosevelt (FDR). His polio diagnoses in 1921 inspired Eleanor to pursue her political goals. She participated in the League of Women Voters, the Women's Trade Union League, and promoted the Roosevelt name in Democratic organizations. 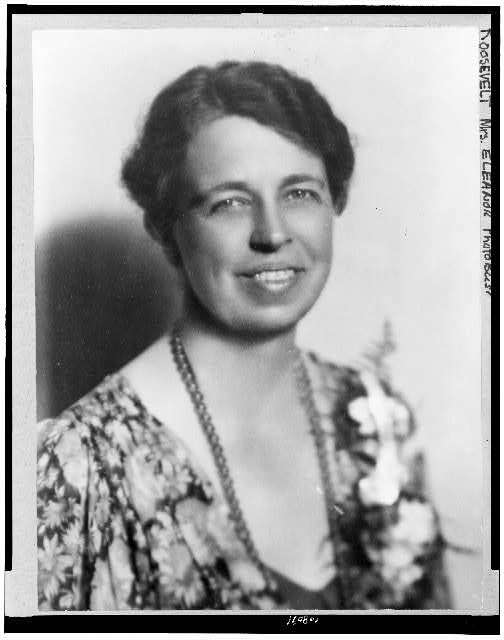 Eleanor Roosevelt proved to be an extraordinary First Lady after assuming the position in 1933. She held her own press conferences that catered to women journalists, protested racial injustice through her resignation from the Daughter's of the American Revolution (DAR), and supported Works Progress Administration (WPA) projects. After the United States entered World War II in December 1941, Eleanor visited England and the South Pacific on goodwill tours to boost the morale of U.S. troops overseas. She continued her fight for racial equality on the home front through her highly publicized visits to the Tuskegee Army Air Field and the Gila River Internment Camp. Eleanor continued to participate in politics after President Roosevelt's death in 1945. She served as chair of the Human Rights Commission, and worked diligently to pass the Universal Declaration of Human Rights. Eleanor also served as a cultural ambassador in Japan after the war, and continued her efforts to promote women's equality through her position as chair of the President's Commission on the Status of Women. She retired to Val-Kill estate in Hyde Park, New York, where she died on November 7, 1962.